Combining the Zerto IT Resilience Platform™ and Microsoft Azure helps businesses achieve IT resilience, by simplifying data protection and disaster recovery and enabling fast and flexible workload migration to and from Azure and between Azure regions, accelerating cloud adoption. Microsoft Azure can be used as a disaster recovery site, eliminating the capex costs associated with owning and operating your own datacenter. 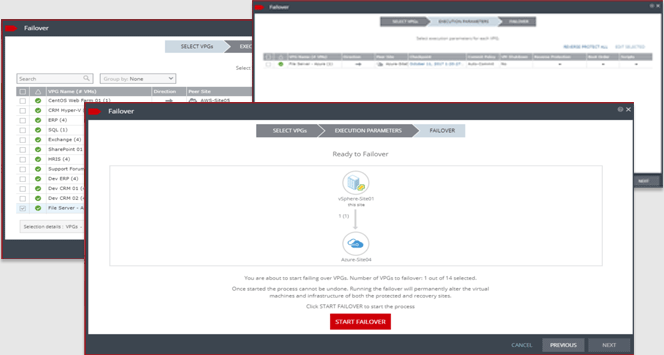 Zerto utilizes continuous data replication, protecting every change in near real-time to ensure your RPO is measured in seconds whether into Microsof Azure, between Microsof Azure regions, or out of Microsof Azure. Remove hypervisor and storage lock-in and replicate from VMware or Hyper-V environments to Microsof Azure, enabling migration into Microsof Azure with minimal downtime or impact. Enable significant cost savings by utilizing Microsof Azure as a disaster recovery site and only pay for what you use, with no recovery VMs created until needed with limitless burst capacity. Remove platform lock-in and replicate into or out of AWS, IBM Cloud or Microsof Azure, and even across Microsof Azure regions with minimal downtime or impact. Entire Sites, Multi-VM Apps, VMs, and Files ——Rewind and recover individual files, folders, VMs, applications, and entire sites from any point in time within the journal, removing the extended data loss traditionally associated with backups. Future-proof your environments to rapidly respond to changes in sofware, hardware,vendors, or organizational requirements. Even as your infrastructure needs evolve, Zerto’s best-of-breed platform will be there to enable any transformation. 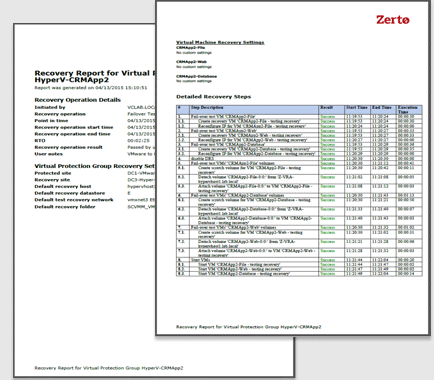 Zerto Virtual Replication can replicate between diﬀerent versions of VMware vSphere, so once you upgrade a server, you can just move the VMs over to the ESXi hosts with the new version. Similar to an upgrade, just move the VMs to the new location and the migration is complete. The weeks of planning and expensive services engagement are gone. Do you want to work with a managed service provider, cloud service provider? Or maybe try out AWS or Azure? ZVR makes it easy to migrate workloads fast. Use Zerto to create a Test/Dev environment that looks just like your production environment in minutes, resulting in higher quality development! ZVR has no hardware dependencies, and it can support any version of VMware vSphere 4.X and higher and VMware vCloud 1.5 and higher and Microsoft Hyper-V Server 2012 R2 and higher. Future-proof your infrastructure and incorporate new technologies on your timeline. Natively multi-tenant, Zerto enables IT teams to consolidate resources and reduce OPEX better ROI on existing assets. One-to-many enables one source VM to be replicated to up to three targets. Keep one copy locally with a 4 hour journal for quick recoveries, and a 30 day journal in the public cloud, delivering IT Resilience at a dramatically reduced cost. Easily incorporate the latest technologies and withstand any disruption and disaster with no impact to end-users or customers. Hurricanes, ﬂoods and other weather events do happen, but so do viruses and ransomware. The journal enables you to roll back the environment to before those issues so you can recover from any data interruption. With seamless agility, applications are easily moved between VMware vSphere, Microsoft Hyper-V, Amazon Web Services, or Microsoft Azure to reduce costs and simply realize the true vision of hybrid cloud. View summary details of the protected and recovery sites in either the protected or recovery site as well as monitor the status of each virtual protection group and any of the virtual machines being protected in either site.